The paper describes the results of the empirical research on career orientations, motivation characteristics, styles of behaviour self-regulation and personal peculiarities of students at the final stage of studies. The authors consider the “career” phenomenon and analyse the foreign and domestic studies in the field of career and career orientations. Key words: career, career orientations, psychology of career, forming of career. 1. Lisovskaya N. B. Professional’naya kar’yera kak ob’yekt mezhdistsiplinarnogo nauchnogo issledovaniya (istoricheskiy aspekt) // Preyemstvennost’ psikhologicheskoy nauki v Rossii: traditsii i innovatsii: sbornik materialov II Mezhdunarodnoy nauchno-prakticheskoy konferentsii, posvyashchennoy istorii psikhologich eskoy nauki, psikhologicheskogo obrazovaniya i 90-letiyu kafedry psikhologii RGPU im. A. I. Gertsena. SPb. : RGPU im. A. I. Gertsena, 2015. S. 212–217. 2. Semikin V. V., Korablina E. P., Pashkin S. B. Soderzhanie i ball’no-reytingovaya sistema otsenki kompetentsiy obuchayushchikhsya v oblasti psikhologicheskogo konsul’tirovaniya // Nauchnye osnovy sovremennogo progressa: sbornik statey Mezhdunarodnoy nauchno-prakticheskoy konferentsii (18 oktyabrya 2016 g., g. Yekaterinburg). Ufa: MTsII OMEGA SAYNS, 2016. S. 141–146. 3. Ternovskaya O. P. Osobennosti kar’yernykh orientatsiy studentov na zavershayushchem etape vuzovskogo obucheniya: dis. … kand. psikhol. nauk. M., 2006. 155 s.
4. Tikhomandritskaya O. A., Rikel’ A. M. Sotsial’no-psikhologicheskie faktory uspeshnosti kar’yery [Elektronnyi resurs] // Psikhologicheskie issledovaniya: elektron. nauch. zhurn. 2010. № 2(10). 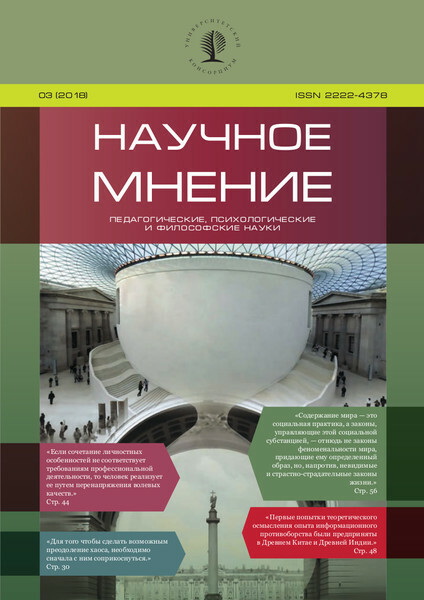 URL: http://psystudy.ru (data obrashcheniya 12.09.17). 5. Tsaritsentseva O. P. Kar’yernye orientatsii sovremennoy molodezhi: teoriya, eksperiment, trening: monografiya. // Mezhdunarodnyi zhurnal prikladnykh i fundamental’nykh issledovaniy. 2010. 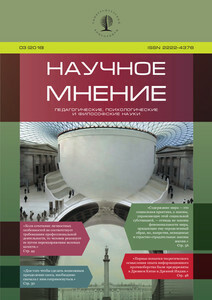 № 6. S. 73–74. 6. Shmelev A. G. Psikhosemantika i psikhodiagnostika lichnosti: avtoref. dis. … d-ra psikhol. nauk. M., 1994. 40 s.
7. Inkson K. Thinking creatively about careers: The use of metaphor // Peiperl M., Arthur M., Anand N. (eds.) Career creativity: Explorations in the remarking of work, Oxford, UK: Oxford University Press. 2002. P. 15–34. 8. Shein E. H. Career Anchors. San Diego, 1990. 9. Super D. E. A life-span, life-space approach to career development // Brown D., Brooks L. (eds.). Career choice and development. San Francisco: Jossey-Bass, 1990. P. 197–261.